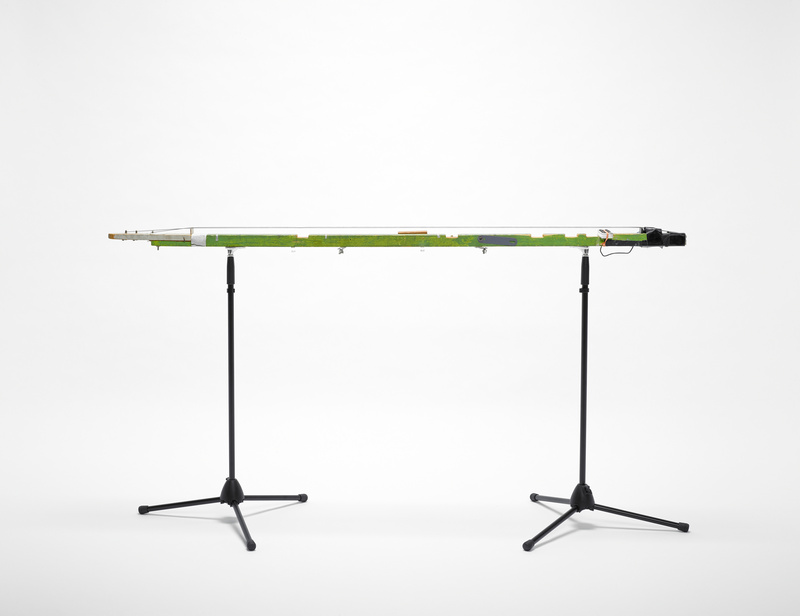 Tony Conrad’s Long String Drone (1972) is a musical instrument with a solitary purpose—the creation of a sustained drone chord. Using this instrument as a point of departure, Walker fellow Liz Glass traces a path through Conrad’s musical experiments of the late 1960s and early 1970s, including his work with the Theatre of Eternal Music, his solo compositions, and his active engagement with New York’s musical and artistic avant-gardes. Glass focuses on the artist’s ideological and conceptual positions seen through the lens of the drone, finding connections between his diverse experiments. Glass, Liz. “The Moment of Enlightenment is a Sound: Tony Conrad and the Long String Drone.” In Art Expanded, 1958-1978, edited by Eric Crosby with Liz Glass. Vol. 2 of Living Collections Catalogue. Minneapolis: Walker Art Center, 2015. http://walkerart.org/collections/publications/art-expanded/moment-enlightenment-sound-tony-conrad-long-string-drone. Tony Conrad, Long String Drone (detail), 1972, wood, bass strings, electric pickup, tuning keys, tape, rubber band, metal hardware, 3 x 73 ⅝ x 3 ⅜ in. (7.62 x 187 x 8.6 cm). Collection Walker Art Center, T. B. Walker Acquisition Fund, 2013, 2013.15.1-.3. 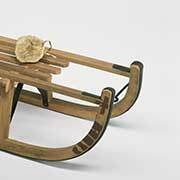 Tony Conrad, Limp String, 1968, wood, metal pipe, wire, electric pickup, tuning keys, bungee cord, 45 ½ x 11 ¾ x 3 ¼ in. (115.6 x 29.8 x 8.3 cm). Courtesy Galerie Buchholz, Berlin/Cologne. Tony Conrad, Long String Drone, 1972, wood, bass strings, electric pickup, tuning keys, tape, rubber band, metal hardware, 3 x 73 ⅝ x 3 ⅜ in. (7.62 x 187 x 8.6 cm). Collection Walker Art Center, T. B. Walker Acquisition Fund, 2013, 2013.15.1-.3. 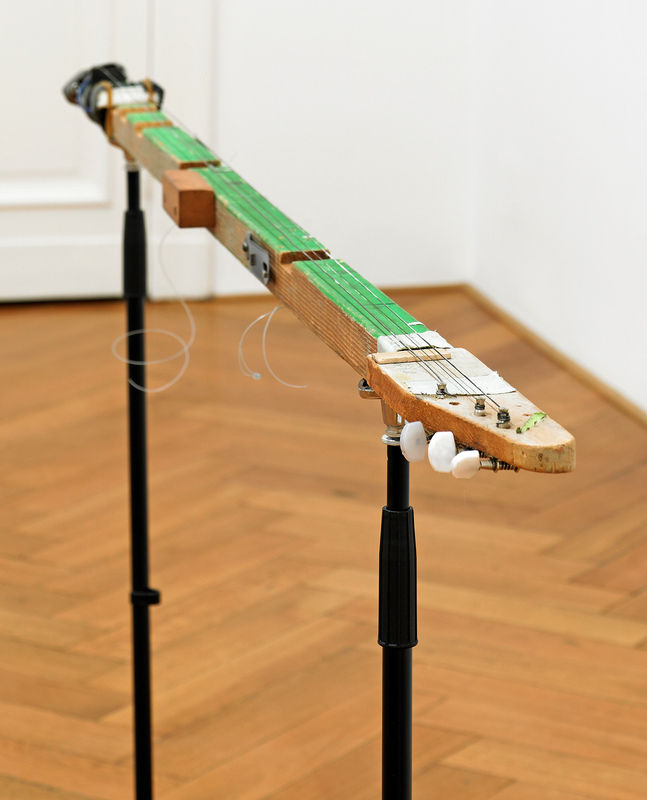 In a video tour of his 2012 exhibition at Galerie Buchholz in Cologne, Germany, Tony Conrad bounces excitedly from one three-dimensional element to the next.1 Invented Acoustical Tools included dozens of Conrad’s “inventions,” ranging in date from the late 1960s through the present. The first object discussed and demonstrated on the video tour is also one of the earliest: a 1968 invention called the Limp String. Conrad holds the wooden board—a long, rectangular shape with an angled section removed from a single top corner—in his lap. Electrified, the Limp String begins to sing as Conrad pulls on a length of wire. A metal pipe borrowed from a vacuum cleaner extends from the bottom edge, serving as a stand for the object, while guitar-tuning keys jut from the angled corner.2 Conrad’s invention is a musical instrument, meant to replicate the sounds of an Indian veena, with its wavering tonalities and taffy-pulled sounds. As Conrad plucks and pulls at the Limp String, he narrates the instrument’s functionality as well as its purpose, stating off-handedly, “So this is the first musical instrument that I devised to try to create a new musical culture. Yeah, that was the idea. Make a new …”3 From there, Conrad moves into a discussion of the next invention, “one of [his] favorites”—Long String Drone, attributed here to the year 1972.4 Long String Drone or, as Conrad coyly abbreviates it, LSD, sits perched on a pair of keyboard stands (not, it seems, original to the era). LSD resembles guitarist and songwriter Les Paul’s first electric guitar, “the log”—referred to as such because of its simple, rectilinear shape—which was made around 1940. Like Paul’s innovation, LSD is a long strip of wood, outfitted with an electrical element (the one musician benefiting from the precedence of the other, using a commercially available guitar pickup), tuning keys, and strings. 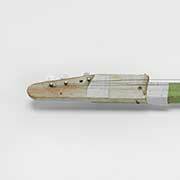 Three long wire strings stretch from end to end, pulled tightly across hand-notched grooves, numeric and alphabetical markings, and a smattering of green paint and duct tape. An active participant in New York’s avant-garde milieu of the 1960s, Conrad’s quest for a “new musical culture” would lead him into collaborations and conversations with a host of artists and musicians. Among them were La Monte Young, Charlemagne Palestine, Angus MacLise, Henry Flynt, Jack Smith, Lou Reed, and Walter de Maria—though the circle was continuously expanding and contracting. Working together, usually outside of any formalized arrangement, this group circulated in a creatively charged New York, experimenting with electronically produced sounds; working through Cagean ideals of chance and indeterminancy; adjusting their instruments to alternative tuning systems; composing scores using words alone or eschewing composition altogether; incorporating psychedelics into their visual and musical practices; and experimenting with various methodologies, traditions, and media. 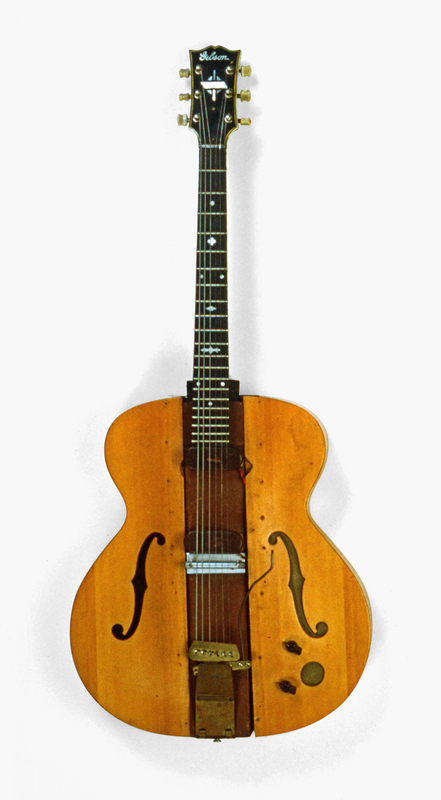 “The log,” an experimental electric guitar built by Les Paul in 1941. Paul’s instrument is made of a central 4 x 4 in. (10.2 x 10.2 cm) piece of pine, with the neck from a Gibson L-12, and removable side wings from an Epiphone archtop attached for aesthetic reasons. Courtesy of Country Music Hall of Fame® and Museum. Tony Conrad, Long String Drone, 1972. 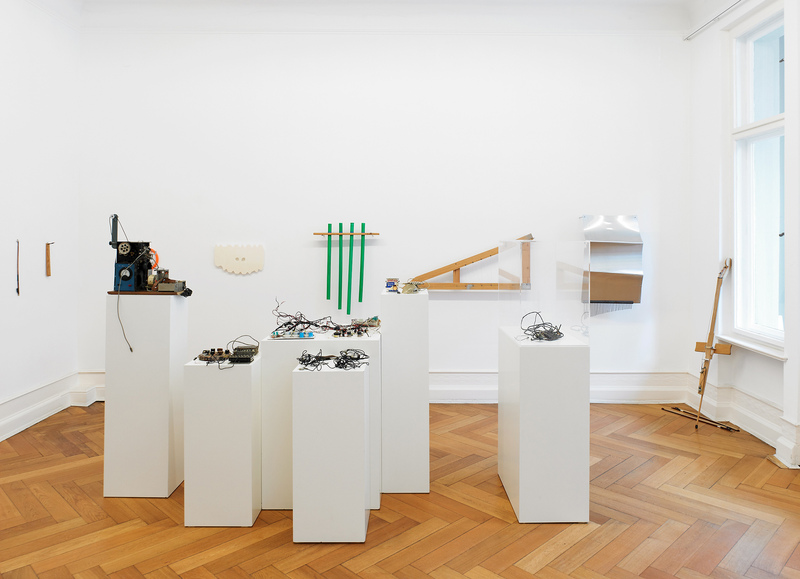 Installation view of the exhibition Tony Conrad: Invented Acoustical Tools, Instruments 1966–2012 at Galerie Buchholz, Berlin, 2012. Courtesy Galerie Buchholz, Berlin/Cologne. 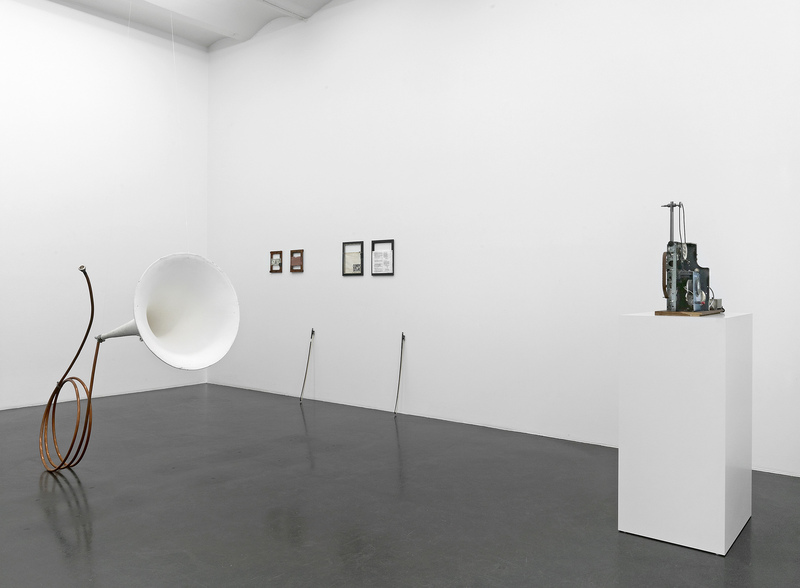 Installation view of the exhibition Tony Conrad: Invented Acoustical Tools, Instruments 1966–2012 at Galerie Buchholz, Cologne, 2012. 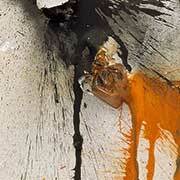 Courtesy Galerie Buchholz, Berlin/Cologne. 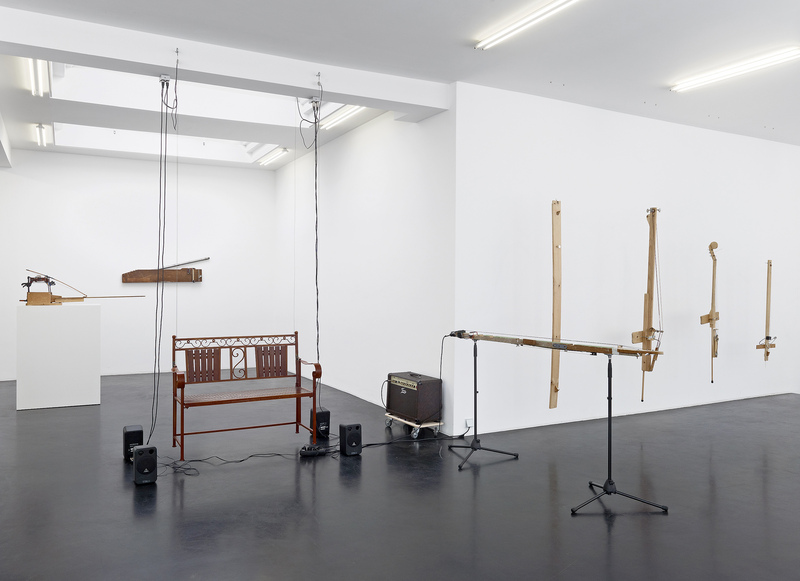 Installation view of the exhibition Tony Conrad: Invented Acoustical Tools, Instruments 1966–2012 at Galerie Buchholz, Berlin, 2012. Courtesy Galerie Buchholz, Berlin/Cologne. While much of Conrad’s development as a musician and artist has been laid out in Branden W. Joseph’s invaluable text, Beyond the Dream Syndicate: Tony Conrad and the Arts after Cage, anchoring an approach to Conrad’s career in the Long String Drone can inspire a slightly different path. Looking for traces of LSD leads through a dense thicket of art publications, tomes such as Joseph’s, and exhibition catalogues, but also to less familiar sources, including liner notes, underground music websites, bootleg recordings, dust jackets, and interviews circulating online. Looking specifically at Long String Drone as an instrument, as well as examining its corollary form (the drone), we can begin to sketch out a particular vision of Conrad’s production that is both cohesive and expansive. Conrad’s affinity for playing slowly and in double stops (striking two notes at once) on the violin is easily transposed onto the Long String Drone‘s form, which enables the player to coax out a single, sustainable chord without the complication of violin fingerings.9 LSD wasn’t the only analogue for Conrad’s violin: he also reportedly took bow to string using mandolins, guitars, mandolas, and violas in his work with the Theatre of Eternal Music.10 He and his collaborators would also use electronic machines to create both droning sounds and other sonic inventions throughout the 1960s and the following decades.11 In the 1990s, Conrad would invent Two Violin Players, a sort of hurdy gurdy–inspired machine that could create two simultaneous drones and still allow for the playing of additional instruments. LSD, then, exists among a pantheon of stringed instruments that Conrad has used to manifest a drone. 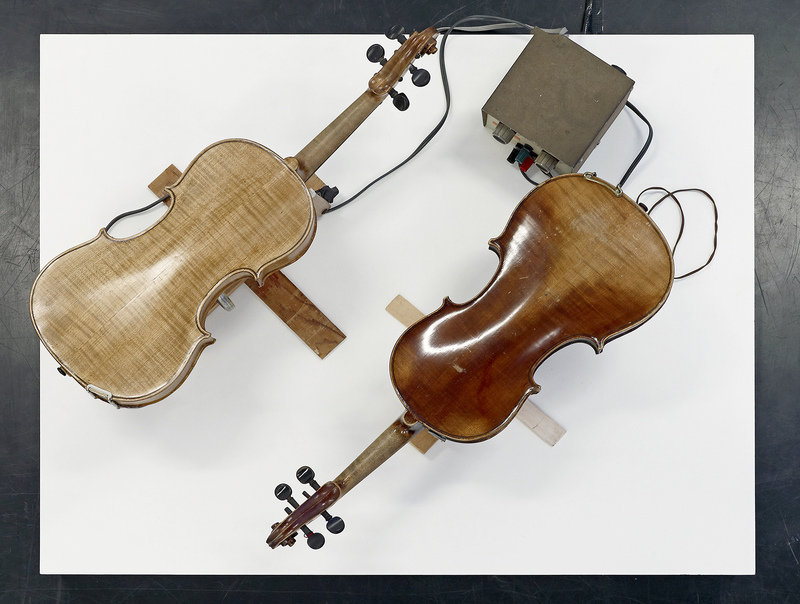 Tony Conrad, Two Violin Players, 1998, electric motor, wire, violins, 12 ¾ x 6¼ x 3½ in./12 x 5 ¾ x 3¼ in. (32.4 x 15.9 x 8.9 cm/30.5 x 14.6 x 8.3 cm). Courtesy Galerie Buchholz, Berlin/Cologne. Looking specifically at the Long String Drone as an instrument, as well as examining its corollary form (the drone), we can begin to sketch out a particular vision of Conrad’s production that is both cohesive and expansive. 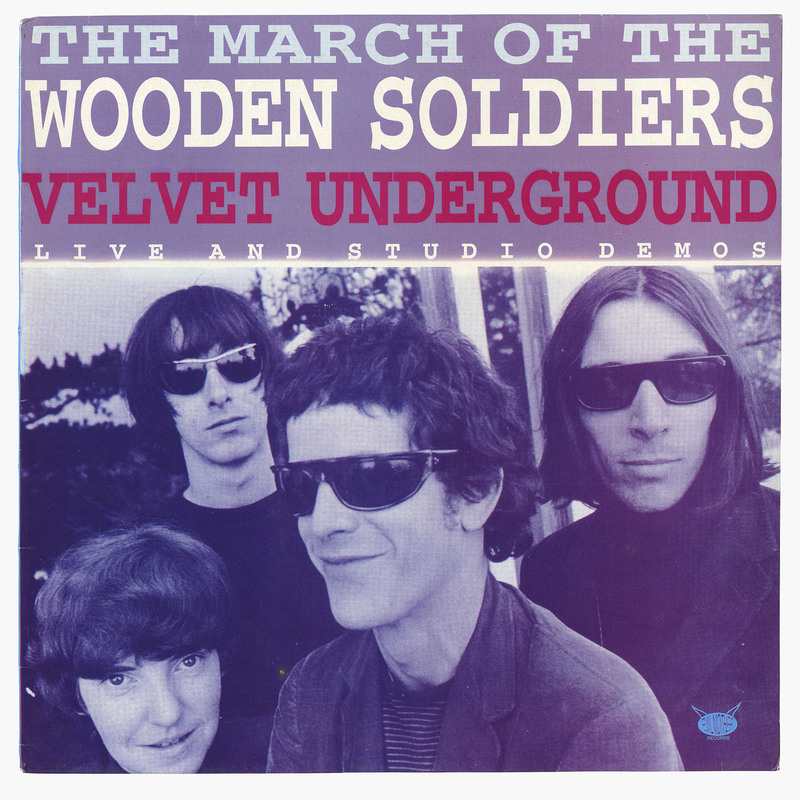 Record cover for the Velvet Underground’s The March of the Wooden Soldiers, vinyl (unofficial release), Evil Mother Records, 1994. The Theater of Eternal Music (also known as the Dream Syndicate) performing in a private loft, New York, December 12, 1965. From left, Tony Conrad, La Monte Young, Marion Zazeela, and John Cale. Photo: Fred W. McDarrah/Getty Images. 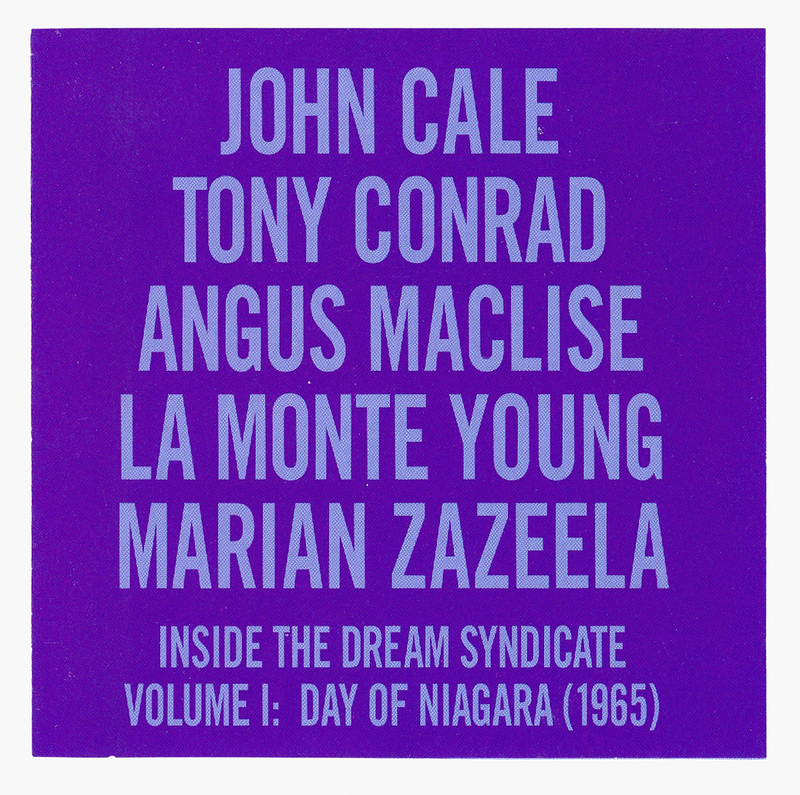 Record cover for John Cale / Tony Conrad / Angus MacLise / La Monte Young / Marian Zazeela–Inside The Dream Syndicate Volume 1: Day of Niagara (1965), CD, Table of Elements, 2000. [The] relationships between volume, duration, and space figured in as important parts of the overall project. The sound created during these performances was intentionally loud—loud enough to create a quasi-architectural space that could envelop both players and listeners. 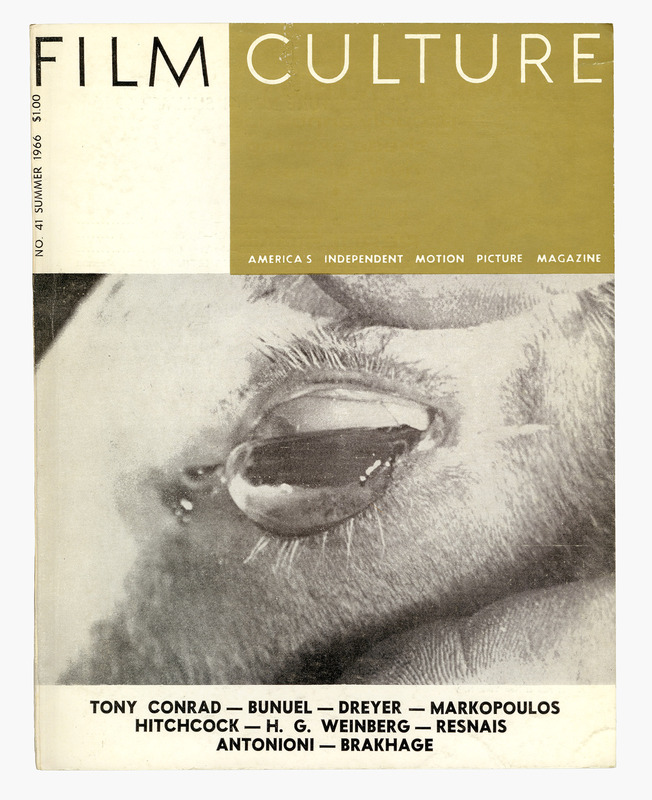 Cover of Film Culture, Issue 41, 1966. Walker Art Center Library. Since the time of their collaborations in the 1960s, Young has claimed the work of the Theatre of Eternal Music as part of his ongoing composition, The Tortoise, His Dreams and Journeys (1964–present); for Conrad, however, these experiments with sound, harmonics, and sustained tones held a different meaning and energy.33 While the music produced by the Theatre of Eternal Music may now be remembered mostly for the strand of minimalism that it would usher into existence, Conrad’s engagement with it in the 1960s (and his ardent attempts to reclaim a connection to it since) has less to do with an interest in being recognized as one of the founding fathers of American minimalism—as Young undeniably is—and more to do with a set of ideological and conceptual positions. Taking the practices of the Theatre of Eternal Music as just one form of musical experimentation among others in which Conrad engaged during this productive decade, we can begin to unravel the ideas that drove Conrad toward a relentless pursuit of the drone. 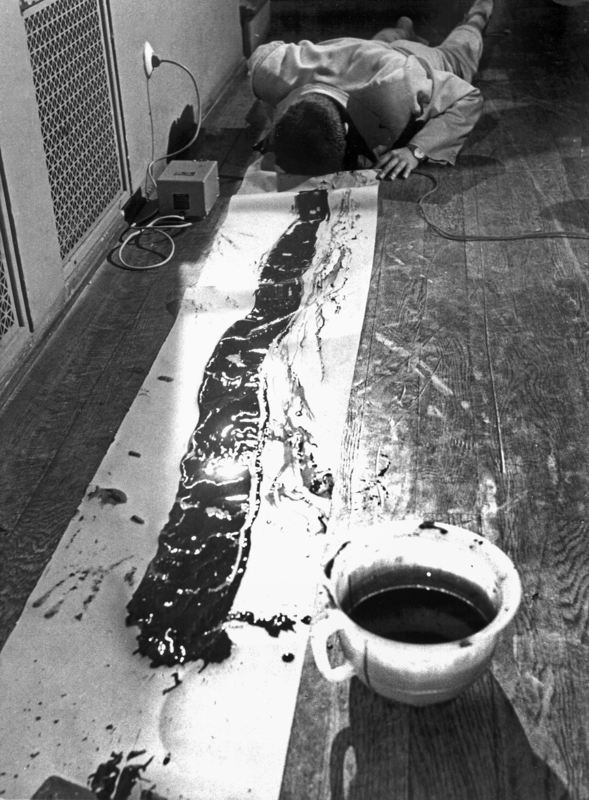 While the term “experimental music” has by now been codified to describe a set of mid-twentieth-century compositional practices stemming from the influence of John Cage, Conrad’s approach to music-making during the 1960s and 1970s reflects a more straightforward invocation of the word “experimental.” Acted out as a series of untested propositions, his experiments included independent musical and multimedia pieces; word-based compositions; a short stint in the Velvet Underground’s precursor band, the Primitives; the creation of film soundtracks using found materials and his own created machines; and live, at times informal, recordings made in collaboration with other musical innovators. Moving chronologically through a selection of recordings, works, and anecdotes that span 1961 through 1972, we can trace Conrad’s artistic path through these overlapping bursts of experimentation. Though the few examples provided here do not likely begin to account for the totality of his musical efforts during this time, together they provide a sketch of what must have been an intense period of artistic and musical exploration and expansion for Conrad. Conrad’s score exists as something of an anti-score; his self-referential, cyclical tautology manifests its completion instantaneously, requiring no outside effort, thought, or participation. This Piece Is its Name reflects his interest in horizontal power structures, as well, with the goal here being the elimination of the separate functions of composer and performer, which Conrad achieves by fusing the instruction’s creation and completion into one simple phrase. 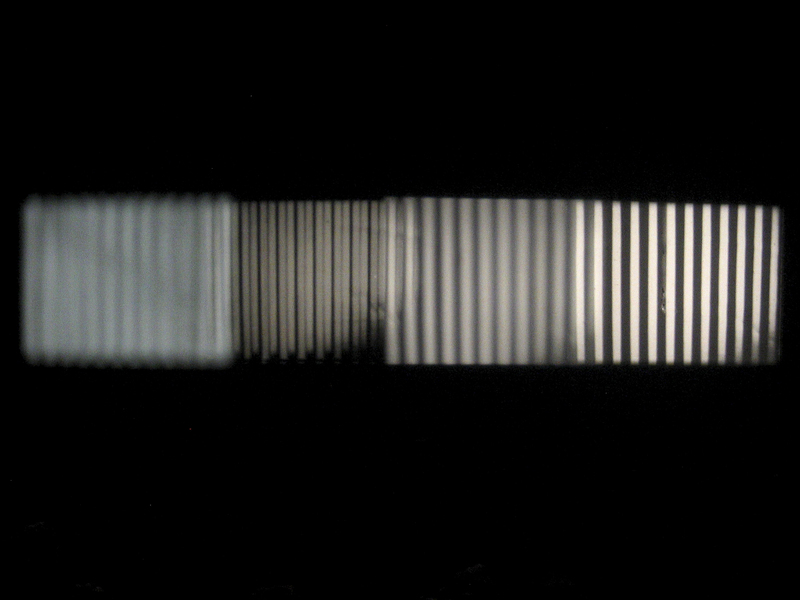 This interest in a “less authoritarian … performance idiom” can be seen throughout the examples that follow, many of which also eschewed the vertically oriented composer-to-composition dynamic through collective decision-making, improvisation, and the abandonment of traditional musical structures in favor of the simplified, rationally determined drone. Conrad and Palestine collaborated on several things soon after their meeting, including the soundtrack to Conrad’s feature-length film Coming Attractions (1970) and the 1969 recording Alloy (Golden 1). Record cover for Charlemagne Palestine’s Alloy (Golden 1), CD, Alga Marghen, 2000. 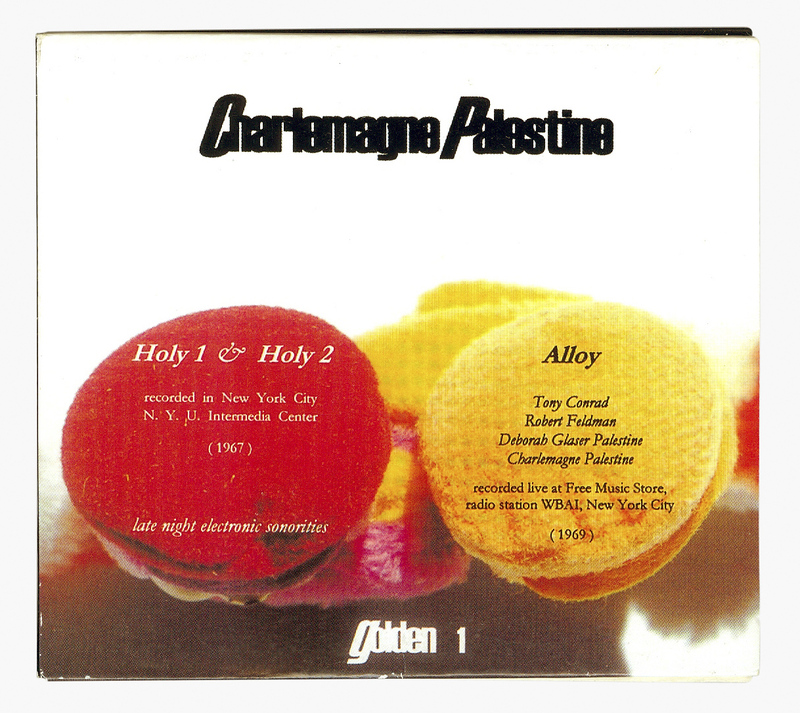 Palestine’s track, Alloy, is anchored by a thick, vibrating drone, which was composed of both live and prerecorded sounds, with a version of Conrad’s Long String Drone being played in-studio, and two of Palestine’s “late night electronic sonorities,” Holy 1 and Holy 2, being broadcast through speakers inside the radio station booth.48 These other tracks (which are also included as separate compositions on the compact disc released in 2000 by the Italian record label Alga Marghen) were made by Palestine between 1967 and 1968. Working in the middle of the night, he used electronic oscillators to generate sounds, which he built up through multiple layers. “I would build up a sound,” he writes in the album’s liner notes, “oscillator by oscillator/then add ever so slightly to the oscillators [sic] input/tiny increments of white noise that would gradually make the sounds thicker and thicker/until they were immense sacred machines humming like gargantuan tibetan [sic] bees.”49 During Palestine’s live session on WBAI,50 these tracks filled the air while Conrad layered in live drone played on the LSD; Palestine improvised clanging tones made on his own invented instrument, the Alumonium, and sang vocal expressions; Robert Feldman supplied percussion on chimes and conch; and soprano Deborah Glaser lent her voice to the din. The dense drone of Conrad’s instrument and prerecorded oscillators provides a structural foundation for the twenty-two-minute track, as Palestine’s clanging instrumentation and ecstatic chants form an abstract, alinear textural field above. Performance still from Tony Conrad’s Ten Years Alive on the Infinite Plain (1972), performed at The Kitchen in New York, May 18, 2005. Courtesy The Kitchen, New York. Again, the relationships between spatiality and sound are important here, with Conrad reinforcing the importance of the physical environment through the use of visual components. Both the sonic and the optic elements comprising Ten Years Alive on the Infinite Plain reflect Conrad’s interest in linearity; slowly-changing perceptions, altered through extended durations; and the use of minimal effects to create a total, immersive, and transformative experience. 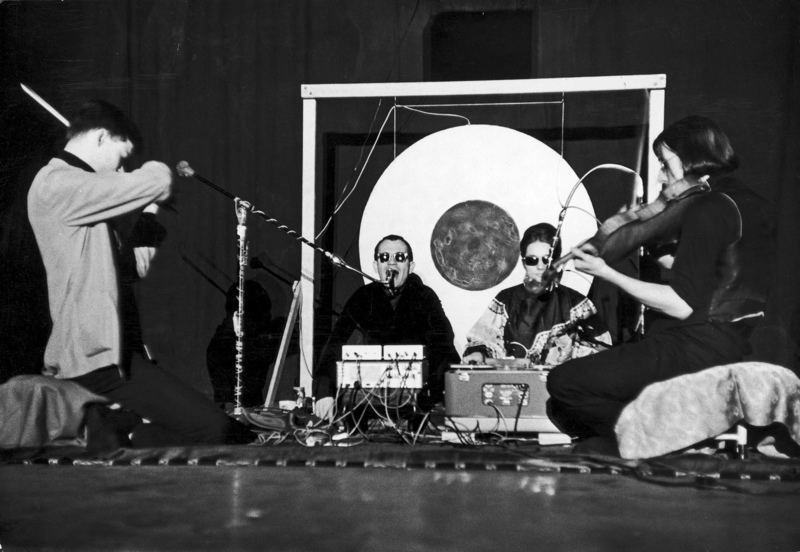 Nam June Paik performing Zen for Head at Fluxus Festspiele neuester Musik in Wiesbaden, Germany, 1962. Photo: Harmut Rekort. DPA/Gottert/Landov. ©The Estate of Nam June Paik. 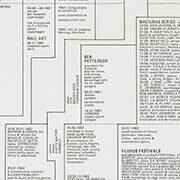 Several years before he would initiate the Theatre of Eternal Music, Young composed a series of word-based scores, or instruction pieces, dedicating many of them to fellow New York artists associated with the Fluxus milieu. In his Composition 1960 #10, Young’s instructions read: “Draw a straight line and follow it.”54 Young’s beguilingly simple score has become an iconic Fluxus work, closely associated in our shared visual memory with Nam June Paik’s embodiment of it as Zen for Head, performed at the Fluxus International Festival of New Music in Weisebaden, Germany, in 1962. Thinking of Young’s score in relationship to Conrad, the entreaty to “Draw a straight line and follow it” can be seen as an apt metaphor. Transposing the directive out of the visual and into other realms, this idea of continuity and linearity can be seen as a unifying thread running through Conrad’s experimental practice. The music created by Conrad and the Theatre of Eternal Music, which relied primarily on a single chord, sustained as long as they could manage, can be seen as one embodiment of Young’s instruction. It is sound with no beginning and no end; sound that proceeds as a continuous line, its various temporal iterations merely tapping back into what they conceptualized as an eternal sound. It is sound that “lasts as long as its middle.”55 And it is a sound that Conrad would reinscribe, again and again, in his own compositions made from the 1960s to the present. If overlaid on top of the linear staff of traditional musical notation, these droning sounds could imply other versions of a straight line. The metaphor can be echoed, yet again, in the physical structure of Conrad’s Long String Drone, which lies flatly atop its supports, its strings stretching tightly across the instrument’s horizon line. Various artists, An Anthology of Chance Operations, 1963, paperback book, 7 13/16 x 8 15/16 x ⅜ in. (19.8 x 22.7 x 1 cm). Collection Walker Art Center, Walker Special Purchase Fund, 1989, 1989.120.1-.4. Arnold Dreyblatt, Jim O'Rourke and Tony Conrad performing their work at Tonic on Thursday night, January 18, 2001. 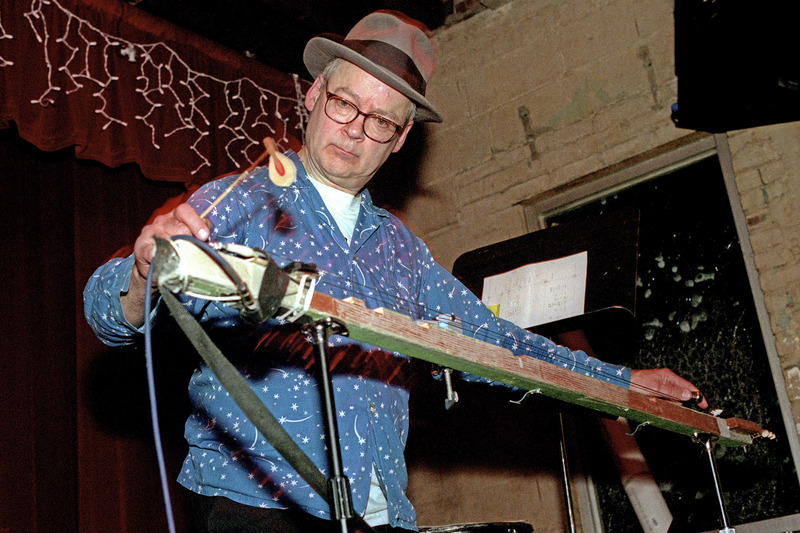 Tony Conrad seen here playing the Long String Drone. Photo by Hiroyuki Ito/Getty Images. In tracing the life of a singular object, Long String Drone, we are led through a particular—and almost painfully partial—trajectory through Conrad’s rich musical and artistic career. But the examination of this instrument and the musical form that it was designed to create also sheds light on Conrad’s ideological and theoretical positions, which can be seen carrying through his expansive practices in sound, film, performance, and installation. Though much of the drone music that he created throughout the 1960s and 1970s was based on a rational study of harmonics and musical techniques, his reflections on these practices invoke language relating not only to music and mathematics, but also to space, architecture, transcendence, time, power, and collectivity. 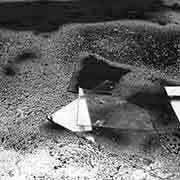 For Conrad, who, along with many comrades, “lived inside the sound” that they themselves created, the pursuit of drone-based music was also a movement toward a radicalized experience of the world.56 His rigorous experimentation prioritized horizontal power relationships between artists and their work as well as audiences and the creators. In absorbing and working through all kinds of musics, cultures, and aesthetics, Conrad envisioned a flattening of artistic hierarchies. And through creating works that pushed the boundaries of volume, duration, and vision, he challenged himself and his audience to move with him, beyond the limits of music as such, into the infinite plain of the psychological horizon. 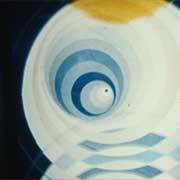 Liz Glass is a fellow in the visual arts department at the Walker Art Center. Her interests in art-music crossovers, performance, time-based artwork (and its documentation), and a host of other intermedia practices have led her down many rabbit holes. These interdisciplinary interests stem from her undergraduate focus on American studies and were enriched by her graduate work in curatorial practice, where her concentration on contemporary artists and organizations included the proto-punk art band Destroy All Monsters, and the now defunct arts organization La Mamelle. She has contributed to exhibitions and publications at the Walker; the Wattis Institute for Contemporary Arts, San Francisco; the Museum of Contemporary Art Detroit; the Jewish Museum, New York; and the San Francisco Museum of Modern Art. Her writing has appeared on platforms including Art Practical, where she was formerly an associate editor; Daily Serving; and Art Papers. 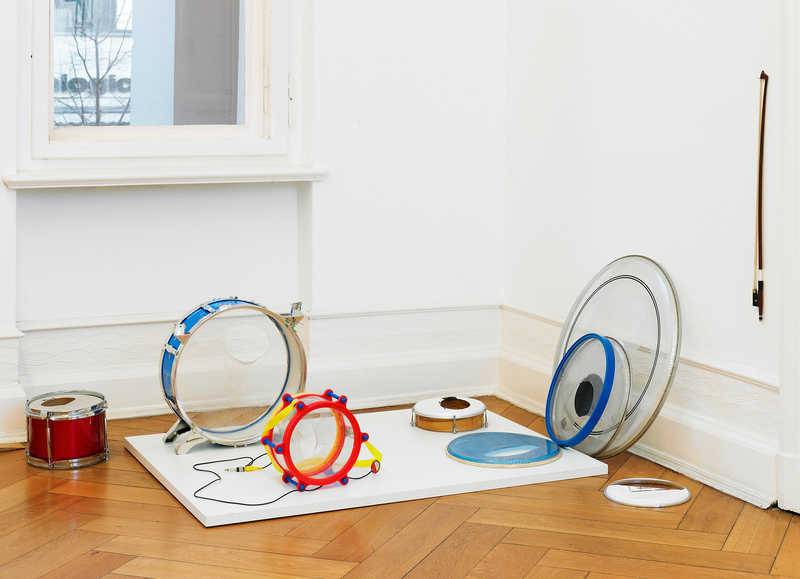 Invented Acoustical Tools: Instruments 1966–2012, produced by Galerie Buchholz, Cologne, 2012. Tony Conrad, liner notes for Angus MacLise: Brain Damage in Oklahoma City, Quakebasket/Siltbreeze, distributed by Revolver USA, 2000. Conrad, quoted in the promotional video for Invented Acoustical Tools: Instruments 1966–2012, produced by Galerie Buchholz, Cologne, 2012. Though Conrad and Galerie Buchholz now date Long String Drone to 1972, Conrad and his instrument appear on a Charlemagne Palestine recording, Alloy (Golden 1), dated 1969 and released in 2000. It is possible that the instrument used in the Alloy recording was another version of LSD, or that in the haziness of a forty-year-old memory, either Conrad or Palestine mistook the date. Conrad’s attempts at rewriting his own history in relationship to minimal music began in the 1990s. His argument for his place within this history was made most vehemently through the 1997 release of his four-disc box set, Early Minimalism, which includes a useful and argumentative essay in the form of liner notes penned by Conrad. This drive relates to Conrad’s ongoing disagreement with La Monte Young, the minimal composer and holder of the recordings made by Conrad, Young, John Cale, Marian Zazeela, and others under the banner of the Theatre of Eternal Music. The feud between Conrad and Young, along with its implications for the history of minimal music and musical authorship, has been discussed at length in various articles and interviews. For more information, see Conrad’s liner notes as well as Jeremy Grimshaw, “The Ideology of the Drone,” in Draw a Straight Line and Follow It: The Music and Mysticism of La Monte Young (New York: Oxford University Press, 2011); and Kyle Gann, “Minimalism Ain’t Pretty: Tony Conrad Makes a Truculent Comeback,” in Music Downtown: Writings from the Village Voice (Berkeley: University of California Press, 2006), 203–207. David Grubbs speaks at length to the dearth of recorded material available from the 1960s avant-garde in his book Records Ruin the Landscape: John Cage, the Sixties, and Sound Recording (Durham: Duke University Press, 2014); and Conrad has spoken, in several places, about his ideas of authorship and “composition,” arguing that the music made with the Theatre of Eternal Music was ideologically based on there being neither composer nor score. See Hans Ulrich Obrist’s interview with Conrad in A Brief History of New Music (Zurich: JRP | Ringier, 2013), 178–195. In a 2005 interview with Jay Sanders, Conrad commented, “Another armature of the [problem of preservation] for me has been that I am my own archive…. So I’ve been looking through my accumulation, a kind of concretion of art material, and there’s an archaeological pleasure that goes along with that. Digging through strata of life. 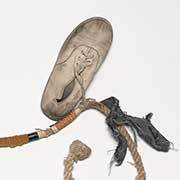 After all, a lifeline and a historical timeline and a geological timeline are, when it comes down to it, the same thing.” Jay Sanders, interview with Tony Conrad, Bomb 92 (Summer 2005), http://bombmagazine.org/article/2752/tony-conrad, accessed September 22, 2014. 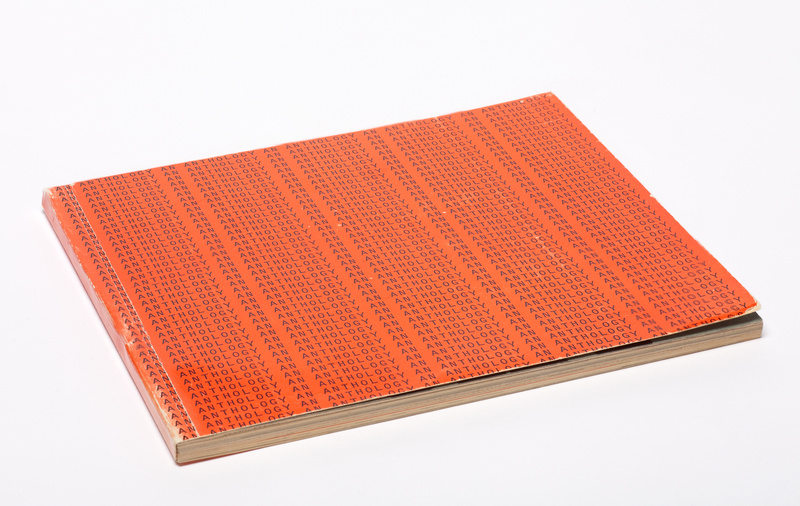 Brian Duguid, “Tony Conrad Interview,” EST 7 (Summer 1996), archived at http://media.hyperreal.org/zines/est/inprint.html. In his essay “Inside the Dream Syndicate,” Conrad writes briefly about the difficulties involved in playing the sort of music pursued by the Theatre of Eternal Music on traditional instruments, noting, “It seems to take a new year of listening to begin to obtain the control that comes only with the self-corrective semiautomatic control of the tiniest beat-elements of the single instrument. The string fingerer fights to find the right spot to press a motionless digit for months before noticing the demands of the right arm for microscopic fingerboard digit-rockings, compensating periodically for the tiny variations in string tension with each change of bow.” Though the first mention of the Long String Drone does not date until 1969, it seems clear in this passage and what follows that Conrad is already interested in alternative electronic modes of creating a drone. “Inside the Dream Syndicate,” Film Culture, no. 41 (1966): 3–8. Keith Potter, Four Musical Minimalists: La Monte Young, Terry Riley, Steve Reich, Philip Glass (Cambridge: Cambridge University Press, 2000), 68–70. Conrad’s experiments with electronic music actually predate the Theatre of Eternal Music with his 1961 composition Three Loops for Performers and Tape Recorders. 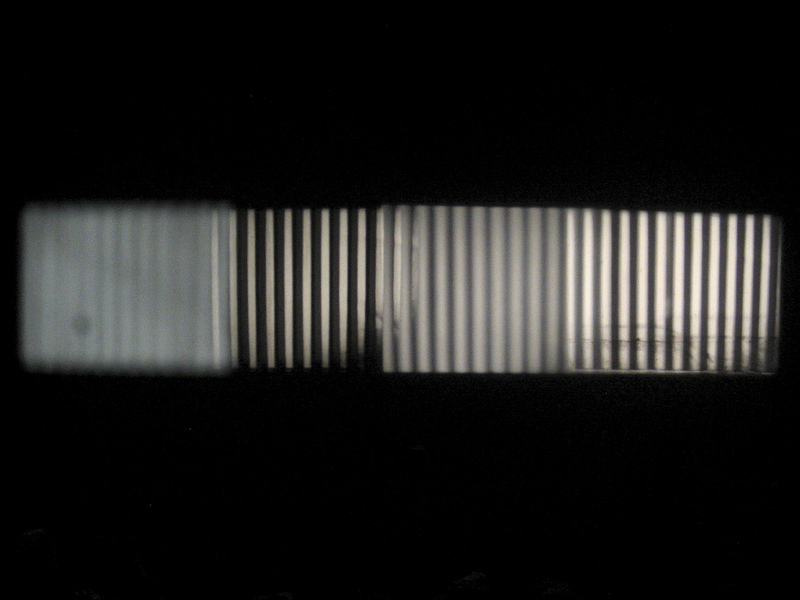 Following his time playing with the Theatre of Eternal Music, Conrad remained involved with Young and Zazeela, managing the electronic sine-wave generators that took the place of live voice and instrumentation in creating the carefully pitched drone for the Dream House installation at Documenta V in 1972. See Branden W. Joseph, Beyond the Dream Syndicate: Tony Conrad and the Arts after Cage (A “Minor” History) (Cambridge, MA: MIT Press, 2008), 11. Conrad’s travels, the connections he made, and the influences that he collected are outlined quite thoroughly in Joseph’s Beyond the Dream Syndicate. Grimshaw, Draw a Straight Line and Follow It, 88. Potter, Four Musical Minimalists, 60. Tony Conrad, liner notes for Early Minimalism, Table of Elements, 1997. Conrad, quoted in Joseph, Beyond the Dream Syndicate, 105. While some reports indicate that long durations of playing were common for the Theatre of Eternal Music, Conrad himself admits that “the group was frequently too stoned to play long enough with adequate focus,” so the length of the sessions varied. Conrad, “Minor Premise,” liner notes for Tony Conrad: Early Minimalism, Volume One, Table of Elements, 1996, 45. Joseph, Beyond the Dream Syndicate, 30–31. This point, that the Theatre of Eternal Music reflected expertise and interests of Conrad and the other collaborators—and not solely Young—has become important in the ensuing copyright conflict surrounding the extant recordings. To this day, Young continues to claim sole compositional authorship over the music produced by the Theatre of Eternal Music while Conrad affirms the contributions that he and others made to the project. Conrad, “LYssophobia: on FOUR VIOLINS,” liner notes for Tony Conrad: Early Minimalism, Volume One, Table of Elements, 1996, 24. Conrad’s own nomenclature for the Theatre of Eternal Music included an alternative name for the group, the Dream Syndicate, and the term Dream Music as a way to describe their output. These phrases appear in Conrad’s 1965 essay “Inside the Dream Syndicate” and are re-inscribed in the title of Conrad’s first commercial recording, a collaboration with the band Faust, Outside the Dream Syndicate (1973), and echoed in the title of Joseph’s text, Beyond the Dream Syndicate. Young bemoans the poor quality of the recording in his statement “On Table of the Elements CD 74 Day of Niagara April 25, 1965,” and Conrad admits in his liner notes for Early Minimalism that the recordings “should anyone ever be able to hear them, are of poor quality, with outrageously poor balance in the mix.” See Conrad, “Minor Premise,” 44–45. Meredith Monk, quoted in Edward Strickland, Minimalism: Origins (Bloomington: Indiana University Press, 1993), 104. Young, quoted in William Duckworth, Talking Music: Conversations with John Cage, Philip Glass, Laurie Anderson, and Five Generations of American Experimental Composers (New York: Schirmer Books, 1995), 243. Conrad, “LYssophobia: on FOUR VIOLINS,” 24. Conrad, quoted in his interview with Duguid, “Tony Conrad Interview,” n.p. Emphasis in original. Conrad, “LYssophobia: on FOUR VIOLINS,” 20. Conrad, “Inside the Dream Syndicate,” 6–7. The disagreements—both ideological and practical—between Conrad and Young regarding the output of the Theatre of Eternal Music dominates much of the literature that has been written about the group in the past two decades. For more information, see the sources cited in endnote 5. Conrad, “LYssophobia: on FOUR VIOLINS,” 14. Conrad, quoted on the jacket of the 2000 Table of the Elements release, John Cale/Tony Conrad/Angus MacLise/La Monte Young/Marian Zazeela—Inside the Dream Syndicate: Volume 1: Day of Niagara. Conrad, interview with Hans Ulrich Obrist, in A Brief History of New Music, 132–133. “An EARful: FOUR VIOLINS and EARLY MINIMALISM,” liner notes for Tony Conrad: Early Minimalism, Volume One, 1996, 3. Conrad, “LYssophobia: on FOUR VIOLINS,” 25. Conrad, quoted in “Tony Conrad Interview,” in The Velvet Underground Companion: Four Decades of Commentary, Albin Zak III, ed. (New York: Schirmer Books, 1997), 38–40. Conrad, quoted in Joseph, Beyond the Dream Syndicate, 228. 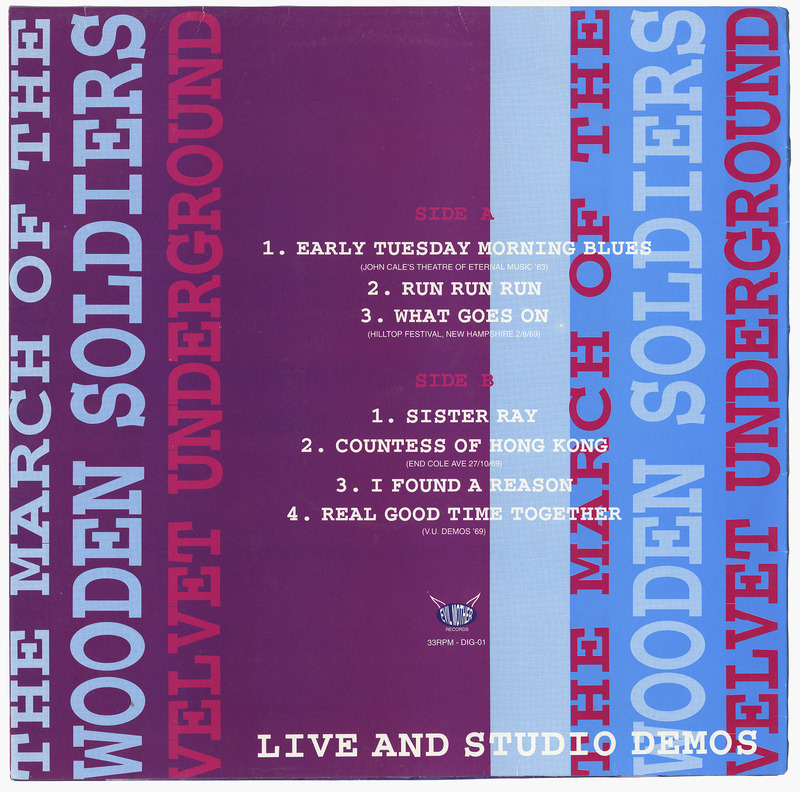 More information about the Primitives can be found in The Velvet Underground Companion, and in Joseph’s chapter, “Primitives and Flaming Creatures,” in Beyond the Dream Syndicate. Flynt’s influence is traced out in Joseph’s text Beyond the Dream Syndicate. Flynt’s own writings provide more background on his ideas, ranging from “concept art” to “hillbilly music,” and can be found on his website at http://www.henryflynt.org/. Flynt’s “hillbilly music,” which borrowed from rock, blues, and ethnic musical styles, can be heard on the recordings Back Porch and Hillbilly Blues, Volume 1 and Volume 2, Locust Music, CD and LP, 2002; and Henry Flynt and the Insurrections, I Don’t Wanna, Locust Music, CD and LP, 2004. Conrad, quoted in Joseph, Beyond the Dream Syndicate, 226. Tony Conrad/Faust: Outside the Dream Syndicate was originally released by the label Caroline as an LP in 1973. The record failed to achieve commercial success at the time, but has been revived following Conrad’s return to the musical scene in the 1990s. It is now widely available on CD, with versions being produced in 1993 by Table of Elements and in 2002 by Table of Elements and the Sandwalking Company. Charlemagne Palestine, quoted in Giuseppe Cordaro, “The Dissonant Ecstasy of Charlemagne Palestine,” Digicult, http://www.digicult.it/digimag/issue-034/the-dissonant-ecstasy-of-charlemagne-palestine/, accessed July 25, 2014. 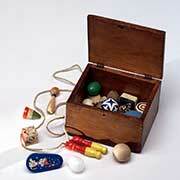 Charlemagne Palestine, liner notes for Alloy (Golden 1), Alga Marghen, CD, 2000. For more about WBAI’s role in providing voice and context to New York’s growing counterculture in the 1960s, see the chapter “WBAI and the Explosion of Live Radio,” in Jeff Land’s Active Radio: Pacifica’s Brash Experiment (Minneapolis: University of Minnesota Press, 1997). Conrad, quoted in Sanders, interview with Tony Conrad. http://bombmagazine.org/article/2752/tony-conrad. Joseph, Beyond the Dream Syndicate, 370. La Monte Young, “Composition 1960 #10,” in An Anthology of Chance Operations (New York: L. Young and J. MacLow, 1963). Conrad, “Inside the Dream Syndicate,” 7.